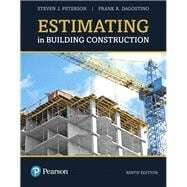 by Peterson, Steven J., MBA, PE; Dagostino, Frank R.
For beginning to intermediate courses in cost estimating and construction estimation. Estimating in Building Construction covers all the skills the beginning student needs to estimate simple to moderately complex commercial and residential buildings. Ideal for construction, architecture, and engineering students, the text covers bid preparation from the general contractor’s perspective, using a combination of theory and principles, step-¿by-¿step procedures, instructor resources, and practice problems. The 9th edition aligns the text with the learning outcomes of the major accreditation bodies ABET and ACCE, giving instructors measurable standards for gauging student success. It includes a new chapter on specialty contractors, two rewritten chapters, and reorganized appendices. Steven J. Peterson is a professor of construction management at Weber State University, where he joined the faculty in 2000. His specialty is the business side of running a construction company and managing construction projects. He is the author of Construction Accounting and Financial Management (2013), Construction Estimating Using Excel (2018), and Pearson’s Pocket Guide to Construction Management (2012). He is the coauthor of Estimating in Building Construction (2019). Before becoming a professor, Steven spent 15 years working in the construction industry. He received an MBA and a BS in engineering from the University of Utah and is a licensed professional engineer.